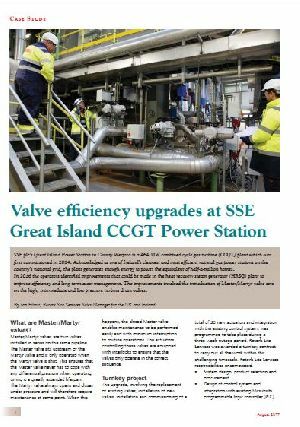 SSE plc's Great Island Power Station in County Wexford is a 464 MW combined cycle gas turbine (CCGT) plant which was first commisioned in 2014. Acknowledged as one of Ireland's cleanest and most efficient natural gas power stations on the country's national grid, the plant generates enough energy to power the equivalent of half-a-million homes. In 2016 the operators identified improvements that could be made in the heat recovery steam generator (HRSG) plant to improve efficiency and long-term assest management. The improvements involved the introduction of Master/Martyr valve sets on the high, intermediate and low pressure turbine drain valves.